Looking for an easy dinner? This sheet pan chicken dinner may be just what you are looking for. Are you looking for easy dinners? I know I am always looking for ways to make dinner magically appear after a day at work. This Sheet Pan Chicken Dinner may be just what you are looking you want. My Sheet Pan Chicken Dinner is made with bone-in chicken breasts, that I simply cut out the breastbone and use them. Often these bone-in split chicken breasts cost much less than the boneless skinless chicken breasts. 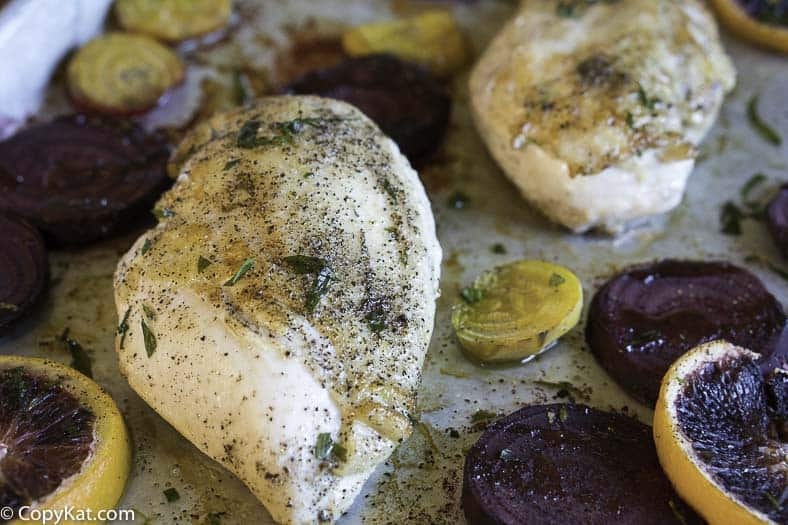 Also in this chicken dinner are some root vegetables, I used beets in this recipe. I used red beets and golden colored beets. You could use other root vegetables like potatoes, carrots, and perhaps even some onions. I also used some fresh herbs, I used tarragon, but you aren’t limited to tarragon, you can use any fresh herbs you enjoy. I think by adding some fresh herbs you instantly add a gourmet touch to your meal. I often grow a pot or two of different fresh herbs during the year, what I keep often depends upon the season. You don’t have to use chicken breasts, I think this could easily be prepared with leg quarters or chicken thighs. The cooking time would have to be increased another 15 minutes or so. This is a very flexible recipe. I seasoned this chicken very simply with just salt and pepper. You may want to use some garlic powder or some of your favorite herbs and seasoning. Love other easy to make dinners? Check out these. You never knew it was so easy to make chicken in the ovoen. Preheat oven to 350 degrees.Season 2 chicken breasts with salt and pepper on both sides. Heat 2 teaspoons of butter in a skillet over medium heat. Cook chicken for 1 to 2 minutes on each side. The chicken will not be done, this cooking is to brown the chicken. 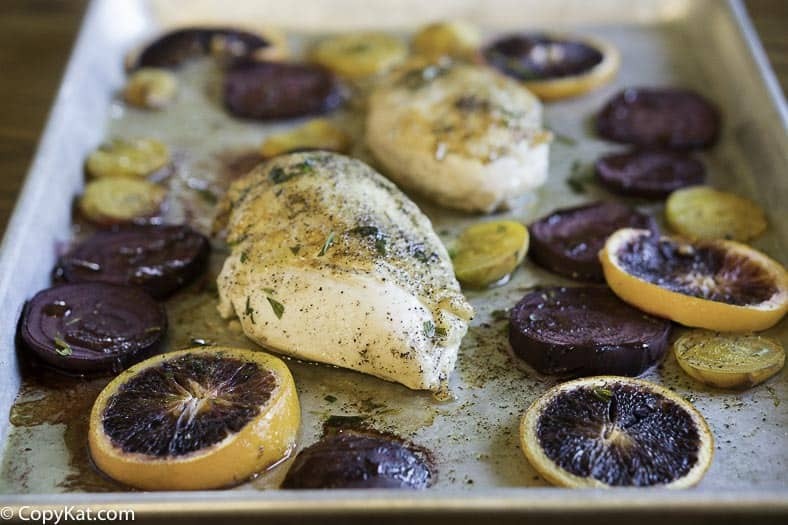 Place chicken on the sheet pan.Peel beets and wash the orange. Slice the beets and orange into thin slices. 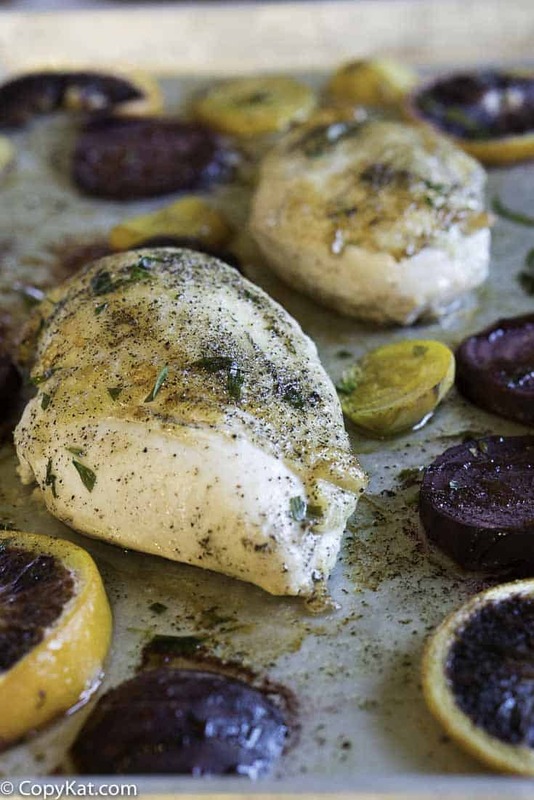 Place beets and orange slices on the sheet pan. Sprinkle herbs over the chicken and vegetables. Drizzle vegetable oil over the vegetables and chicken. Season with salt and pepper. Cook for approximately 30 minutes. OMG! Love your recipes and the blog in general! Sounds delicious, soon as I’m out of hospital I’ll try for sure. Love the idea of beets & carrots. Thank you!